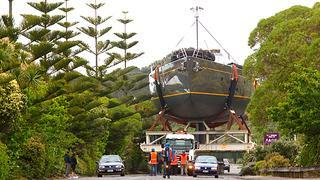 October 28th saw the 50m flybridge sloop Ohana launched at Fitzroy Yachts in New Plymouth, New Zealand. Designed by Dubois Naval Architects, Ohana is the eighth Dubois design to be built at the yard. Complementing her modern lines and timeless design is an equally beautiful interior. Her European owner will enjoy a well-appointed master stateroom located aft with additional accommodation for 10 guests in five cabins. The main deck, filled with natural light, is home to a generous saloon and dining space. Ohana is now undergoing sea trials and will soon travel from New Plymouth to Auckland to have her mast stepped and to undergo further trials before her delivery in December.